Pre-drawn audit diagram symbols represent tagged process, process, decision, tagged document, I/O, etc. These symbols help create accurate diagrams and documentation. 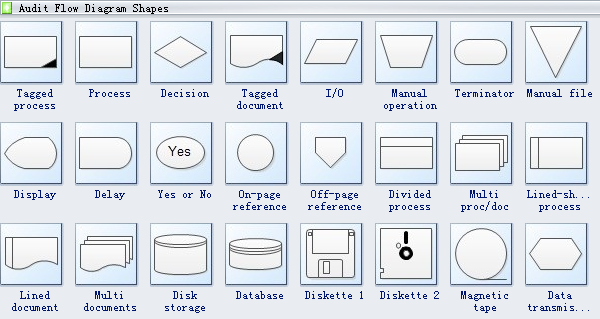 The audit diagram templates provide you lots of special shapes including tagged process, process, decision, tagged document, I/O, manual operation, terminator, manual file, display, delay, on-page reference, off-page reference, etc. You are free to choose any shape you like. Audit diagram templates offer you many useful shapes. Audit flow diagram shapes like tagged process, process, decision, tagged document, I/O, manual operation and more are available. I/O, short for input/output, it is used to describe any program, operation or device that transfers data to or from a computer and to or from a peripheral device. Terminator is a device attached to the end-points of a bus network or daisy-chain. On-page reference indicates that the next or previous step is somewhere else on the flowchart. It is particularly useful for large flowcharts. Off-page reference uses a set of hyperlinks between two pages of a flowchart or between a sub-process shape and a separate flowchart page that shows the steps in that sub-process. Manual input represented by a rectangle, with the top irregularly sloping up from left to right. An example would signify data-entry from a form. Reference point is a basis or standard for evaluation, assessment, or comparison; a criterion. Title block is a portion of a blueprint that contains information such as the company name, part name, part number, designer, scale, and material. 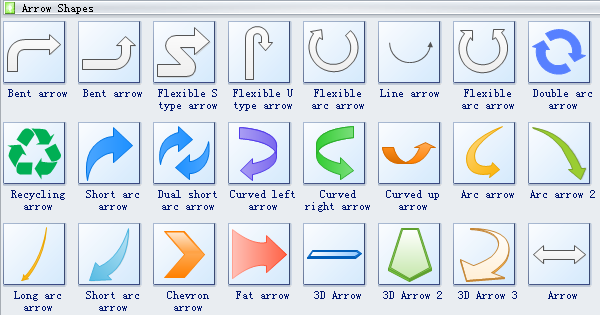 Need fresh looking SDL diagram symbols for your design? These SDL diagram symbols are a cinch to pop in. And their crisp, fine detail will make spectacular, easy-to-understand diagrams and presentations to your customers. Need fresh looking audit diagram symbols for your design? These audit diagram symbols are a cinch to pop in. And their crisp, fine detail will make spectacular, easy-to-understand diagrams and presentations to your customers.